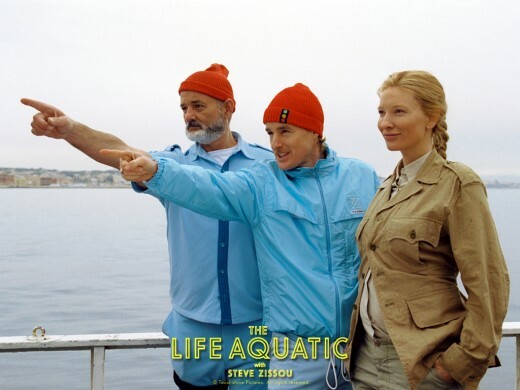 While not as critically successful as his other movies, Wes Anderson’s The Life Aquatic with Steve Zissou was just as cool, kooky and stylish as anything else from this unusual director. In the years since the release of the movie there’s been an unusual level of interest in the costumes worn by Team Zissou, Bill Murray’s squad of offbeat documentarians. While it’s easy to buy the signature Zissou red hat, and the Internet is full to bursting with Steve Zissou shirts, the one item from the costume that proved a little more tricky was the Team Zissou shoes. 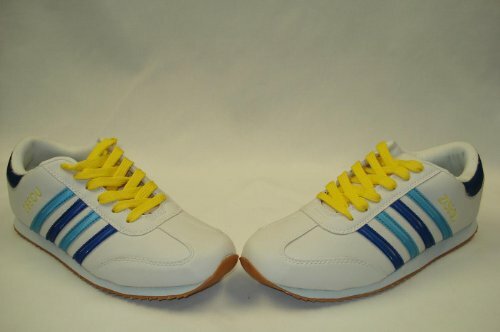 Team Zissou shoes, as is explained in the movie, were a limited edition released by Adidas at the height of Zissou’s fame (and soon discontinued as Steve’s career fell into decline). The sneakers, of course, never really existed in real life, but an unusual number of fans have since scoured the world for a pair similar to the iconic Team Zissou shoes. Fortunately for those devoted souls the search is over. A screen accurate version of the Team Zissou shoes is now available for the low price of $79.99. The sneakers are accurate in every detail: four stripes alternating between navy and sky blue; thick yellow laces; ‘ZISSOU’ embossed into the side in gold lettering. We grabbed our pair of the Team Zissou shoes last week, and so far we can say that they’re comfortable and well made. While a tribute piece such as this can often be shoddily constructed (we once had an Indiana Jones replica leather jacket that arrived with the arm hanging off thanks to terrible stitching) these shoes are extremely well made. 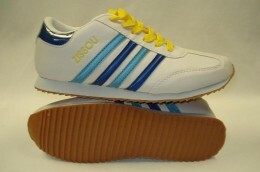 In fact, there’s nothing to indicate that they weren’t really made by Adidas in honor of Zissou.